Excessive 5-LOX activity is associated with 7 of the leading 10 causes of death in the US, causing more than 1.5 million deaths annually. The activity of an enzyme called 5-LOX leads to excessive release of pro-inflammatory molecules, including leukotrienes. 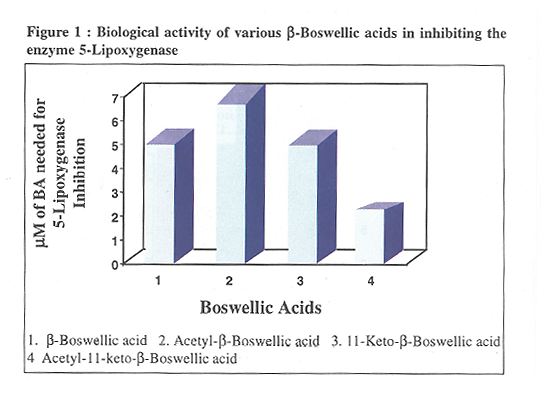 Extracts of boswellia are natural inhibitors of 5-LOX activity and have been used for millennia in treatment of diseases with inflammatory components. The 5-lipoxygenase (5-LOX) pathway is the major source of proinflammatory leukotrienes. 5-LOX breaks down arachidonic acid to pro-inflammatory compounds like leukotriene, a molecule that attacks joints, arterial walls, and other tissues. 5-LOX itself facilitates undesirable cell division changes. New research into the Boswellia resin has shown that the Boswellic acids found within the resin are powerful inhibitors of pro-inflammatory molecules, and may prove to be more effective than NSAIDs. Specifically, the acid 3-O-acetyl-11-keto-beta-boswellic acid (AKBA) has been identified for it’s ability to inhibit the enzyme 5-LOX, intervening at the cellular level to block its unwanted effects. Inhibiting this enzyme restricts synthesis of inflammatory signaling leukotrienes. 10. Ammon, H.P.T., Safayhi, H., Mack, T., Sabieraj, J. (1993). Mechanism of antiinflammatory actions of curcumine and boswellic acids. Journal of Ethnopharmacology.